"Spectral Reflections" was recorded live in Cologne's LOFT. 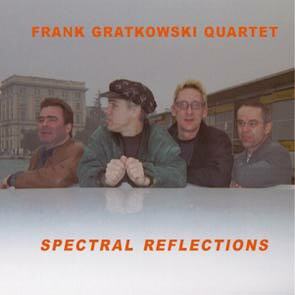 All compositions are by Frank Gratkowski written especially for the members of his quartet: Wolter Wierbos (trombone), Dieter Manderscheid (bass), Gerry Hemingway (drums), and Frank Gratkowski (alto sax, clarinet, contrabass clarinet). This is powerful, no-nonsense music played by no-nonsense musicians. Here is an OGG sample from track 1 (length 44 seconds, average bitrate 75 kb/s), which is quite different from track 2.